How to walk with hurting friends :: join me for an online book club? Actually, it must have been for years, because I asked a friend to bring this book with her when she was coming to visit us in Australia a few months after our first miscarriage. That title encompassed what we’d experienced as many friends on two sides of the world chose to walk alongside us, our hearts grasping at breath after the loss of our baby. My life was marked. Our family’s lives were marked. I can only imagine hard much harder our road would have been without them just showing up. The book quietly testified to that truth from shelf by title alone until just a few weeks ago. The spine of the book unbroken until a sweet young friend of mine found herself a new member of the sorority none of us wants to be in — the women who’ve miscarried. That’s when I went hunting for the book in a box yet unpacked. I opened it, asking God to help me know how to love my friend well. Even after weathering the loss of two babies (another one, Gabriel, last December), I felt a wave of amnesia as to what had ministered to my heart so much. Help me know how to love her, Lord? How can I help? Do you ever wonder the same when you hear of a hurting friend? There can be barriers, can’t there? I don’t want to say the wrong thing. Or, I am a horrible cook. Or, I’m actually scared of medical things. Or, It’s too close to home. Or, My own wound is still so raw. Those are valid concerns. If they weren’t, we wouldn’t be held back. But I’d like to offer that we were made in God’s image. And He’s always been in community with Himself, the godhead, as the Father, Son and Spirit. We were crafted from our very start for community. No wonder we long for that at our deepest level. What would it look like to move toward others, empowered by the One who made us, knowing that we need to receive and we need to give? We need each other. Kara Tippetts’s story was not a story of disease, although she lost her battle with terminal cancer. It was not a story of saying goodbye, although she was intentional in her time with her husband and four children. Kara’s story was one of seeing God in the hard and in the good. It was one of finding grace in the everyday. And it was one of knowing “God with us” through fierce and beautiful friendship. The author, Kara Tippetts, writes this in the introduction of the book. I absolutely love this. Maybe you’ve had a taste of a community of friends that seem to match Kara’s words. Or, perhaps, you haven’t but that picture stirs you to think that something like that could exist. Join me in a very loosely organized online book club starting today. Next Tuesday I’ll write a post asking for your thoughts. This is what I’m really looking forward to! Until then, I’d love you to leave a comment on the blog with one practical way that someone has “shown up” for you, big or small, that really helped when you were going through a hard time. Did you know there will be 10 million college freshmen entering a U.S. college this fall? Whew! What an incredibly important time to pray and help these young men and women connect with people who love Jesus on their campus. I and about 15 others are crammed into a meeting room at Cru headquarters for National College-Bound “Scouting” Day. Using Facebook, we and many others with Cru throughout the country are scouting out incoming college freshman who are Christians, so that we can offer to connect them with an upper-classmen that is involved with Cru. Would you pray for us to be successful in finding as many incoming Christian freshman as possible, so they can get plugged into with other believers with Cru the first week of classes? We are so hopeful for many, many college students to respond to the very good news of Jesus this fall! Ten years ago, Scott drove to Ft. Collins, Colorado in his brown pickup. He didn’t know anyone but me and a handful of my friends. 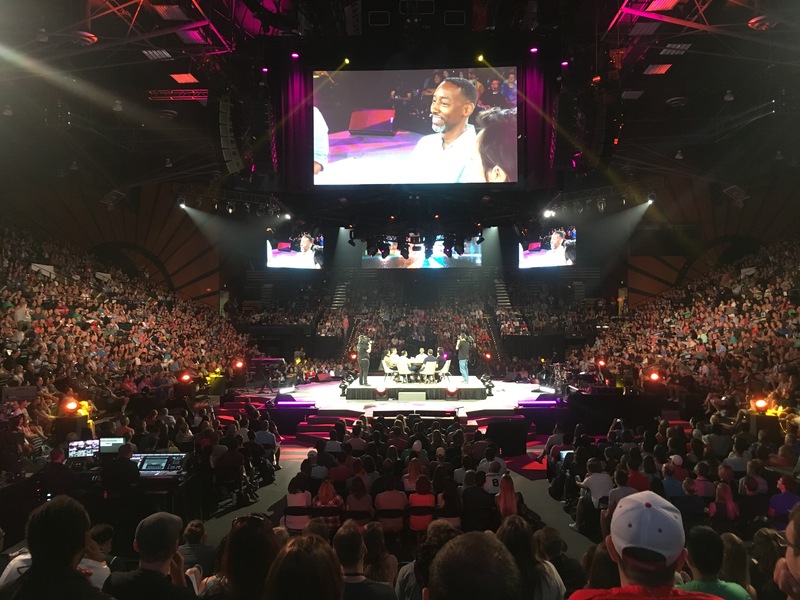 He’d taken vacation from his IT job to check out this Christian missions group at our biennial conference, and ask God whether he was to join as a missionary. 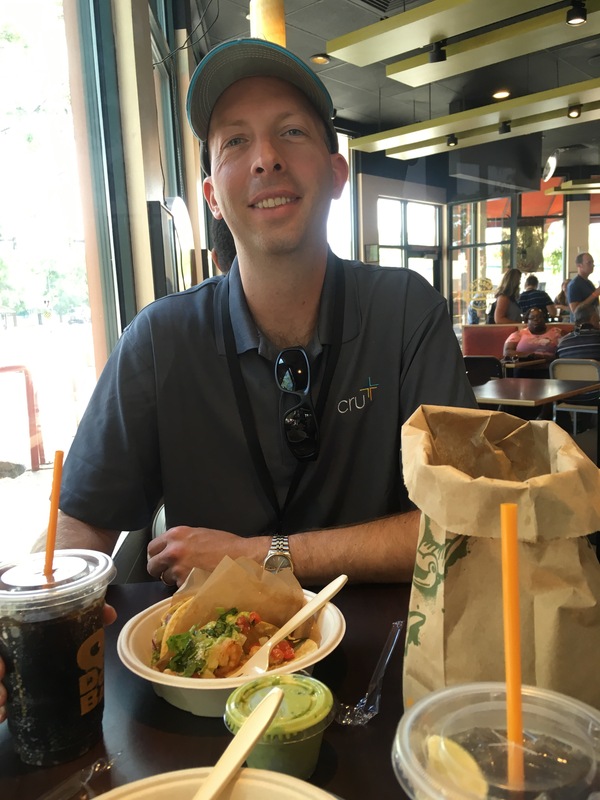 He and I talked with two Cru HR folks over lunch at a table at this same Qdoba. God was stirring. And today, ten years, we are here eating lunch. Tears of gratitude to God who is fully capable of changing the world all Himself, yet He chooses to involve us. On a rainy day in early December, Scott and I walked down the labor and delivery floor hall, passing oversized photos of smiling babies on the walls. Our hearts and our overnight hospital bag weighed heavy. Our baby’s 13-week heartbeat was gone and we had come to be induced and deliver him. Dani stood waiting for us at the end of the hallway. When we approached, I began crying. She hugged me with such tenderness, more like a treasured friend than a patient. Today, almost seven months later, Dani (below, holding bear) again stood waiting for me at the end of the hallway. This time, I hefted a cardboard box filled with gifts. Scott carried two boxes behind me, with kids in tow. And just like before, tears filled my eyes when I neared Dani, and spilled over when we hugged. Joy and sorrow mixed, as our family presented the first of 36 weighted Comfort Cubs and “Quietly” instrumental CDs to Dani’s nursing team (some pictured below) to give to other bereaved mamas and their families who lose a baby, whether a few ounces or 10 pounds. I was given one of these bears the day Scott and I met our tiny Gabriel, then held and said goodbye to him. The weight of it caught me off guard as it felt more like a baby than mere a stuffed animal. I sobbed. The letter, written by a mom who’d lost a full-term baby, ministered incredibly to my heart. She wrote about the weight of that moment and of the significance of my child. As I read about her hope in Jesus I almost immediately pictured a different scene—a mom who wasn’t yet a believer in Jesus, holding a bear and the letter. I knew God was stirring something. My due date was to have been May 22nd, so Scott and I decided a way we’d honor the life God gave us in Gabriel would be to raise money to buy 24 bears and CDs (the CD is one that brought me great comfort these last months). We were stunned when God doubled that, moving 52 individuals and families to give enough to purchase 48 bears and CDs—enough that we’re giving 36 to my beloved Florida Hospital and 12 to St. Elizabeth’s in Lincoln, my hometown hospital. Last night I stayed up late fluffing each bear and tying around its neck my letter of comfort and the hope of Jesus. As I did, I asked God for insight in how to pray for the mom who would hold that specific bear. Oh, the things that came to mind and the subsequent tears. We’d love for you to pray with us for the 48 moms and their families who will have had to say excruciating goodbyes to their baby(ies) the day they receive these bears. I’m not one for stuffed animals, but when Joy offered this bear to me, I gratefully reached out and received it. A moment later, my brain registered the fact that the bear wasn’t a fluffy, win-at-the-fair animal. It was unusually heavy, almost like lifting a gallon of milk assumed empty, but actually full. It was in the first hours after Joy’s incredible team of nurses settled me into the hospital room, given me hugs and space and time I needed before I was induced to deliver Gabriel, carried 15 precious weeks. With Scott next to me, we talked with Joy and soon found that her compassionate care stemmed from a love for God. She told us about a gift she had for us, given by a woman who’d lost a full-term baby. Joy returned to the room a bit later with the weighted bear. I became the 4th in a line of women touched by loss and the gift that placed weight into empty arms and acknowledged the weight of a precious life lost. My bear and precious letter was from Erin Ashley, a mama who’d lost a baby girl at birth. She’d received her bear from Lindsey, a mama who held then said goodbye to two baby girls. Lindsey received her bear from her nurse who’d experienced loss. Last November, Erin Ashley (center) and her family presented 12 Comfort Cubs to Joy (right) labor and delivery’s head nurse at Florida Hospital-Altamonte. One month later, on December 6, 2017, I received one of those bears. This week I learned that there is only 1 bear left, meaning 11 of us mamas (and families) have lost a baby in just 6 months at this hospital in this little part of the globe. My heart drops with that news, knowing that my story of delivery of a tiny baby in miscarriage at a hospital is rare. Wow, what would that number have been if we also knew how many miscarriages happened outside those hospital walls in those months? Gabriel’s due date would have been this Monday, May 22nd. Our family longed to celebrate his tiny life by celebrating other tiny lives and comforting moms and their families and pointing to Jesus, our very great hope. So, here’s an idea. How about we, together, put more Comfort Cubs and an instrumental CD, below, (listen here) that’s ministered to me incredibly–into the arms of those who face loss this next year? Here’s how you can give, if you want to come alongside us. “My Mac laptop is so slow. I’m think I might need to get a new one. Is there anything you can do?” Cristina asked us. Cristina is a young woman who serves with Cru’s hispanic ministry, Destino. This ministry was born out of a dream that Latinos could come together to worship Jesus without sacrificing the unique expression of their cultural heritage. She arrived in Plano, Texas to attend a conference for all Cru missionaries whose passion is to reach ethnic minorities with the gospel. As a service to these staff members, my (Scott) team flew there to make ourselves available to fix any computer/phone problems they were having. I glanced over at Javier (photo, above), who is a certified Mac technician sitting at the desk with me. “Here, I’ll see what I can do,” he said, reaching for her computer. Cristina’s Mac is 6 years old and has several failing parts, but not a total loss. While she attended the conference sessions, Javier worked on her computer. Cristina’s laptop went from almost unusable to performing like it was brand new! Over the next few days my team upgraded computer parts on laptops, removed computer viruses, and replaced smartphone batteries as well as offered one-on-one training about how to use various software programs. It’s a bit like a pit-crew team. We help our missionaries like Cristina with her computer, getting her fixed up and back on the track to do what God’s called her to. Technology is a wonderful, wonderful tool to help life and ministry work much more efficiently. We all get stuck sometimes and need a little help! Thinking about Revelation 7:9, I look forward to the day when you have the privilege of worshiping the Lord side by side with Cristina, and representations from every tribe, tongue and nation. I’m on a journey of emotional eating and have been for years. There are times I’ve walked over to join someone else walking the path, or motioned over for them to join me. That seems so very silly–even ludicrous to actually say out loud–but that’s what my flesh thinks would be good. It’s God’s incredible mercy that dissolves me in the most wondrous way, at times. Like recently. He is stirring in me a desire to stop living solo and ask friends to sojourn with me. I’ve had seasons of wanting to read the latest book or try the latest “fix” but something’s shifted in my soul in the last handful of years. I have a keen awareness that if I could’ve changed things on my own by now, I would have. Rather, what I’m hungry for is a bigger view of Him (thanks for putting that to words in my kitchen, Meredith). My gut (no pun intended) says that’s the core of real, lasting change and freedom. As I consider His character, His attributes and what He’s done for me…oh! How that affects my heart. He becomes more the Greater Affection. And herein lies a huge piece of the puzzle for me: The Expulsive Power of a New (I’d say Greater) Affection. Thank you, Thomas Chalmers, for your sermon with that name. You were born 200 years ago, but I think we’d be contemporary sojourners if you lived today. Thomas Chalmers, the well-known Scottish preacher, in his famous sermon “The Expulsive Power of a New Affection,” says it all: Seldom do any of our habits or flaws disappear by a process of extinction through reasoning or “by the mere force of mental determination.” Reason and willpower are not enough.